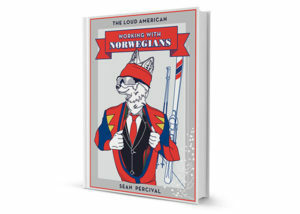 My latest book, The Loud American: Working with Norwegians is available now. This book is the beautiful story of a successful American venture capitalist who met the Norwegian business culture and learnt a great deal. The Loud American presents his reflections and learnings, giving unique insights into the way Norwegians and Scandinavians do business. This outsider’s view is packed with tips and tricks so that foreigners and Norwegians can be better at doing business together. It comes at a time when Norway is pivoting around entrepreneurship and needs tools to succeed doing business abroad and collaborating with different cultures at home. The book is published by Mondå Forlag, a Norwegian publisher who’s vision is to make Scandinavia more competitive. Like myself, they believe that internationalization is not merely about creating diverse teams, it is about benefiting from this diversity. BUY ONLINE FROM TANUM, NORLI AND ARK.